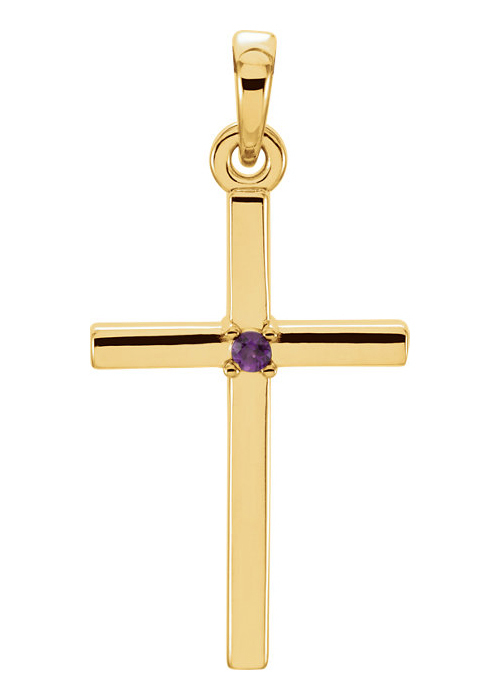 Apples of Gold Jewelry offers a beautifully polished amethyst cross pendant in 14K yellow gold, with a genuine amethyst stone and a warm yellow gold that is perfect for every occasion. The 1.75mm amethyst gemstone is held in place by 4 prongs in the middle of the cross, and is AA rated. The shining, polished yellow gold of the cross pendant measures 1 inch tall and 1/2 inch wide, making it a great size to wear with a variety of other jewelry pieces or clothing. "Come unto me, all ye that labour and are heavy laden, and I will give you rest. "(Matthew 11:28). We guarantee our Polished Amethyst Cross Pendant, 14K Gold to be high quality, authentic jewelry, as described above.